Even if you aren't the most technically-minded cyclist, you've no doubt heard of Zwift. It's taken the cycling industry by storm, and for good reason too. No longer do you have to spend hours of mindless spinning on your stationary trainer in seclusion during the winter months. In its simplest description, a training session on Zwift is like a combination of turbo training and an online video game. You get a similar feeling of riding outside with a group from the convenience of your own home. It's interactive, immersive and just plain fun. Zwift is an online platform that pairs your trainer setup with a computer, smartphone or tablet to allow you to "ride" in a virtual setting. The program offers five worlds to pedal around, from the fictional Watopia to London to the 2015 Richmond World Championship course. Depending on the time of day, you'll be joined by thousands of other cyclists around the world, all training on the same virtual roads in real-time. You can draft, pass and be passed in Zwift, just as you would outside. Zwift designed over 100K of virtual roads with volcanos, underwater tunnels and snowy peaks to explore. While causal riding is common, Zwift also offers structured workouts designed by elite World Tour coaches with on-screen prompts and real-time metrics. You can also create your own training program, and Zwift connects with third-party apps like Strava and TrainingPeaks to make sure you never miss recording a ride. Social group rides are also scheduled sporadically throughout the day, from regular weekly rides to contest-based races with prizes and incentives from partnering brands. It's not uncommon to see professional cyclists and triathletes training on Zwift as well. Setting up Zwift is relatively easy. If you've used a GPS cycling computer and paired Bluetooth or ANT+ sensors, you likely have the technological know-how. For the most realistic training environment, we recommend buying a smart trainer to pair with Zwift. The app/program takes control of the trainer's resistance, making it tougher to spin when climbing up a hill and easier while cruising downhill. A smart trainer will also provide power data that is beneficial when using the workouts. If you have a standard stationary trainer (or rollers), your next best bet is to pair your power meter to the program. If you don't have a power meter, you'll need a speed sensor (although this isn't as accurate) at minimum. You can also pair your heart rate strap and cadence sensor to see complete, real-time metrics while training. If you really want to go off the deep end, Wahoo offers a smart fan that speeds up and slows down depending on your heart rate, as well as a climbing unit that elevates your front wheel when the gradient in the program changes. Zwift is compatible on a PC or Mac, as well as iOS devices like iPhone or iPad. Simply download the software, create an account and pair your devices and sensors. A USB ANT+ dongle is required to pair ANT+ sensors, and Bluetooth sensors should be able to pair with your iOS or Mac device. From there, all that's left is to customize your avatar, pick your bike and start training. For additional features, we recommend downloading the Zwift Mobile Link app, which will provide information on nearby cyclists, allow you to control where you turn at intersections, give a "Ride On!" or elbow flick and allow you to chat with others. 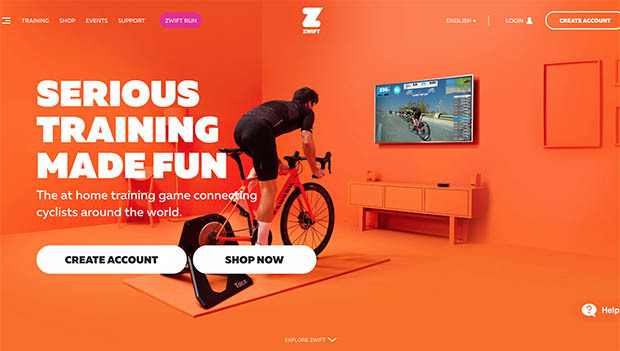 Currently, Zwift is offering a promotion for new users to register and ride free for seven days. Once the trial week is up, a membership goes for $14.99 a month. Note the software isn't the only cost associated with Zwift. As previously mentioned, you'll need sensors, a trainer and a compatible mobile or desktop device (oh, and a bike). It's easy for costs to add up once you include all the add-ons and gadgets, but even in its simplest form, Zwift is a valuable (and proven) tool for cyclists of all experience levels.